While this book is written in a fictional setting, the core of the material has a scientific basis. INJECTION! presents a potentially unique and often candid look at aspects of the pharmaceutical and medical industries with the goal of revealing major disease trends that are already endangering the health of millions of unwary people. 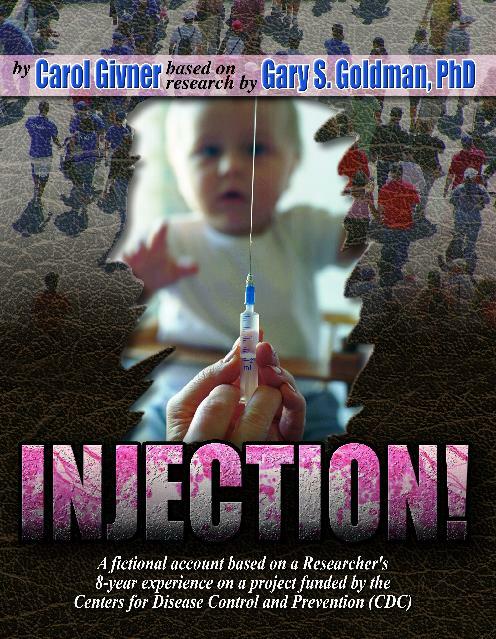 The book is based on the research and experience of Gary S. Goldman, Ph.D., who served nearly 8 years in a population-based vaccine study funded by the Centers of Disease Control and Prevention (CDC). The fictitious town of Sycamore Springs is not unlike most urban U.S. cities. The public health officials strive to administer vaccines to children in a timely fashion according to the childhood immunization schedule. The town physicians all believe that the Universal Varicella (Chickenpox) Vaccination Program is completely safe and will lead to better health of not only children, but all individuals in the community. Unfortunately, the vaccine has not been adequately tested and vaccination gives rise to a more serious disease that the healthcare authorities plan to treat with still another vaccine! The appendices, authored by leading scientists, researchers, and medical doctors, highlight relevant information supporting the medical issues discussed, including varicella vaccination, hepatitis B vaccination, MMR vaccine, Thimerosal-containing vaccines, vaccine adverse reactions, and more. The central figure is a ruthless man, Dr. Damon Leviticus, who puts his personal profit above the good of humanity. He is well respected in the community because he is a skillful liar. Very smooth. He has successfully used his family and his community for his own gain in the past, and when a new opportunity arises, he is the first to recognize its potential. He is completely self-absorbed and sees nothing but himself. He has a hero complex, but he doesn't understand what being a hero really is. He thinks it's flags and parades, anything for self-aggrandizement. He treats his family like possessions, but is especially fond of his only son. As a family physician, he puts his reputation and energy toward a mass immunization project, to protect every man, woman and child from chickenpox and its possible fatal complications of encephalitis and pneumonia. He's got to be the hero, one more time, to turn his skeptical son into one of his followers. He organizes the mass program, called Injection Day. But he has opposition in the form of a young, inexperienced investigative reporter, Millie, who has heard about the program and wants to stop it. She's a friend of his son, and he steps in to stop the budding romance. Injection day arrives following a huge media blitz. Dr. Leviticus orders his reluctant son to take the first injection in front of media coverage. He's going to get his son’s respect at last. But then something goes wrong. Various individuals start experiencing adverse vaccine reactions; an 18-year-old, strong with no health problems ends up on life support. A new mother becomes disoriented while driving and crashes. She miscarries. A grandfather becomes concerned when his grandson regresses and becomes autistic. The independent studies weren't wrong; but the good doctor won't admit he was. He favors the results produced by the pharmaceutical-sponsored studies despite seeing firsthand, many anecdotal problems that arise within his own community. GARY S. GOLDMAN holds a Ph.D. in Computer Science. He served 8 years as Research Analyst on a population-based vaccine study funded by the Centers for Disease Control and Prevention (CDC). Dr. Goldman is a renowned expert in varicella (chickenpox) and herpes zoster (shingles), with numerous peer-reviewed medical journal publications.